Petra reports ... Lynn Donohue encouraged us to enter this vets race and the 10 Harriers who went were not disappointed. The sun shone and the mud was minimal, always a bonus in a XC event. 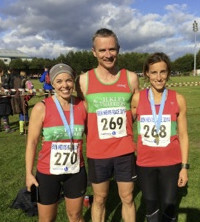 The races were of a slightly unusual format, with all the ladies and the men over 70 only running 5K, and the men aged 35 to 69 running 10K, i.e. 2 or 4 laps of an undulating grass course in a local park. Friendly and well organized, my only small gripe was that the course was well short, 2.6 miles certainly does not make 5K. Having saved myself for a final dash I was confronted with the finish line rather sooner than I expected. From Geoff Howard ... I've run many times at Saltaire but never before at Salt Ayre, Lancaster and Morecambe's AC's base, with its excellent clubhouse and track. They held a flat fast 5k (five runners under 16m) at the unusual time of 6.30pm. James Bowness (Trafford AC) was the winner in 15m 21. Some way behind, but pleased to dip under 20m for the first time this year, I managed 19m 57s, first v70, in 34th position out of 76. This sets a V70 Club Record. From Steve Turland ... Perhaps not the best preparation for the YVAA XC the following day but a very enjoyable race over the Lancs border. 1300ft in just over 4 miles so a tough little race, with a full set of junior races too. Won by Simon Bailey, I finished in 11th place in 38 mins 30. Still awaiting full results but Chloe and Sarah Haines there too with Sarah picking up a prize. It felt a long way round the XC course today. From Hilda Coulsey ... Billed as "One of the most scenic marathons in the world" and my childhood home I ran a wonderful half marathon on cliffs, beaches and rocks. It was challenging; up and down seemingly hundreds of inlets, hugging the coast/ cliff-line from Ballintoy to Portballantrae past the magnificent Giants Causway. An ultra (60k), marathon, half, 10k and 2 walks are all available and the scenery really is magnificent (thankfully the weather was kind). Half: (Mark McKinstry 1:26:51), I was 160th in 2:17:45 out of the 379 who ran. A super weekend of competition for some of our younger runners. Harry Maslen U20 finished 5th (out of 42) in the English Schools Combined Events decathlon today, beating the 6,000 points total again, and helping West Yorkshire to team Bronze; and Ruaridh Mon-Williams and Lucy Haines represented England on the fells both for the first time, in the 'Home Countries International Junior Mountain Running Championships' (phew!) in Ireland. Jamie Hutchinson reports ... 8m 1500 ft climb organised by Cleveland mountain rescue starting from Lordstones cafe near Stokesley. An initial short climb and loop back through the event centre at Lordstones before heading north along the ridge taking in a few bumps before the turn and heading back through the woods and minimal up and down. Great race with bonus of on site cafe facilities! The race was won by Paul Williams in 62:32. I finished in 66:05 and 7th, 72 ran. Petra Bijsterveld reports ... I went to Marsden for this new race starting at Butterley Reservoir and taking in a further 4 reservoirs in just under 5 miles. Billed as a good introduction to fell running I was seduced by the photos of the route on their website, and the race certainly lived up to it. Well marked and taking us through beautiful landscapes. Thankfully it was dry as the stone flagged paths would not have been so trouble free in the rain. I would certainly recommend this race, assuming they put it on again. The 3rd Ilkley Aquathlon, jointly organised by us and Ilkley Swimming Club at Ilkley Lido was a great success with 171 competing on the day including many Ilkley juniors. Well done to Steve & Gaenor Coy co-ordinating. Jann Smith reports ... Results from Three shires Fell Race. 12.4 miles/ 4003ft. Starts from Little Langdale and summitted 4 x Lakeland peaks, Wetherlam, Swirl How, Pike O Blisco and Lingmell. Ilkey were 1st ladies' team. Steve Turland reports ... 4.5m and 3000ft, a real leg burner this one. I finished in 14th place in 78 mins. Joss Naylor was there giving out the prizes! 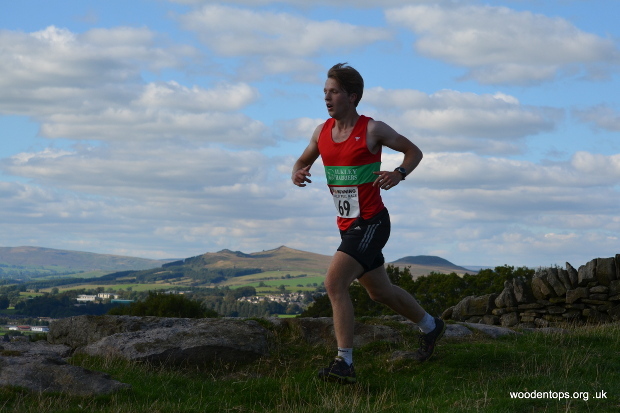 The Half was a counter in the Ilkley Harriers Race League. Alison Weston reports ... Long day out for most of us at the weekend on the 60th Lake District Mountain Trial a one day orienteering event in Patterdale this year over a choice of 3 courses :- Classic (~16 miles, 7000ft), Medium (~12 miles, 5,000ft) or Short (well relatively -10 miles 3,500ft). The Haines family turned out in force with Hector winning the long Classic route in 04.09hrs, over 30 mins ahead of the second runner, Peter and Chloe completing the Medium course and Sarah the short course (wait until Lucy is old enough to run too!!) Jonathon Whitaker easily won the Medium course and Helene ran the short course to test her knees on downhills (plenty of that!!). I struggled with route choice a bit as there was a long way between some check points and all sorts of routes tried by different runners. For one leg some runners dropped down to Grisedale tarn and up onto Helvellyn ridge, others up Swirral Edge to the ridge or a direct way via red tarn. I opted for a steep climb up to join Striding Edge in the mist and then a long run along Helvellyn ridge. Who knows which was best? 'Dithering' certainly does NOT help though! From Sally Malir ... the race must have been one of the nicest road races that I have ever done, helped along by a beautiful September morning. We started at Sherburn Air Club and ran along closed, scenic flat roads perfect! I decided that I was going to force myself to try a new race strategy as anything under a marathon I tend to set off far too fast and suffer later on. The plan was to take the first three miles easy then work my way through the field from there on. This plan worked really well and I finished strongly and a minute ahead of my target time. I finished 5th lady overall in a time of 1.27:18 which puts me 5th also in the UK for my age group! I am now having a couple of weeks rest before starting marathon training. 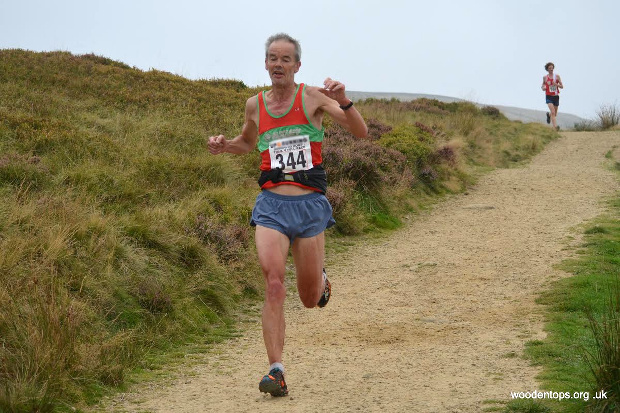 68 runners competed in the super Ilkley Incline uphill race, organised for the 10th time by Geoff Howard. Ilkley's Jack Wood sprinted it out with top international mountain runner Emma Clayton to win in 7:47; Emma's 7:49 smashed the ladies' course record. Georgia Malir led in a string of talented young Ilkley Harriers to take the ladies' team prize to match Ilkley's men's team prize. And there were Ilkley prizewinners in many other categories. 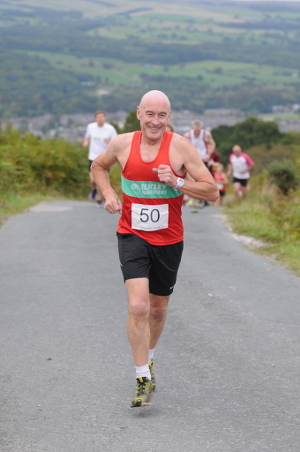 Results & photos on the Ilkley Incline page. The Incline was preceded by the fast, furious, fun Junior Sprint Fell Relays which had a record 21 teams.